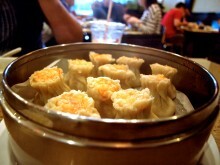 Once upon a time, some great people brought me to a place called Din Tai Fung. 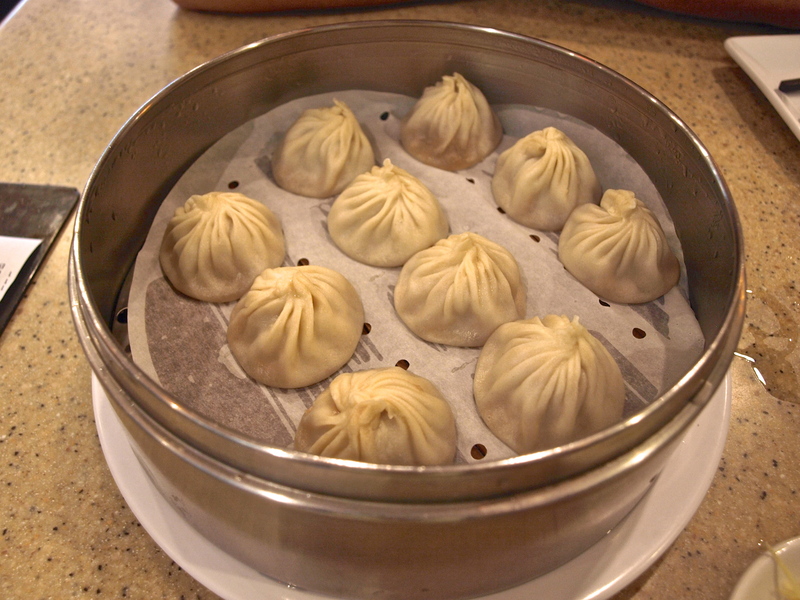 Although I was living in Shanghai at the time, I had no idea what to expect on this first visit to Xintiandi and my first introduction to Xiaolongbao (way before it was cool). Luckily, they taught me how to bite in without scalding the insides of my mouth, and I quickly fell in love. 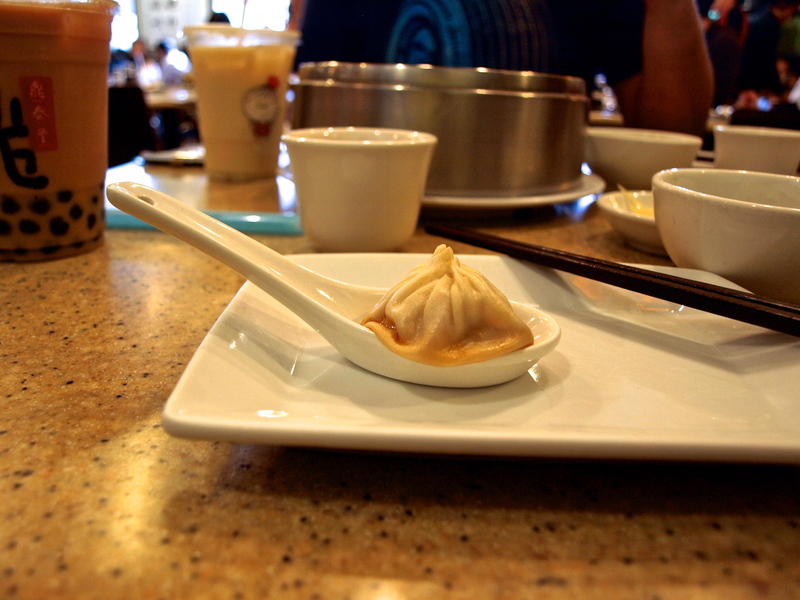 More than six years later, I finally made in back to Din Tai Fung, but this time it was in Arcadia, California. Despite the obvious distance between Arcadia and Shanghai, much of Arcadia looks like it was pulled directly out of China. The Din Tai Fung, though, looked little like its counterpart across the Pacific. In Shanghai, Din Tai Fung is a fancy pants dumpling house. It’s in an affluent part of town and not exactly priced for commoners. In Arcadia it’s a pretty basic place with prices for anyone (to be honest, the actual dollar amount of the food in each place is probably very similar, however, people make much more money on average over here). Nonetheless, the options on the menu were quite similar to what I remembered from back in the day. You can tell it’s crab because of the random carrot piece. So, like any good dumpling-seekers, we began with old-fashioned (pork) Xiaolongbao and its not-so-old-fashioned cousin with pork and crab. Combined with the black vinegar on the table, these guys brought back some great memories. 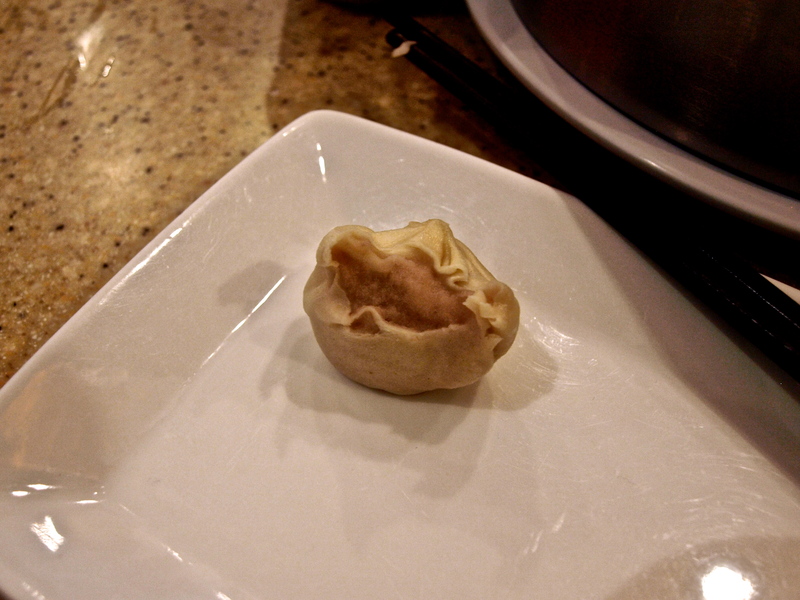 Although they came out steaming, the soup inside wasn’t as hot and scalding as other Xiaolongbao I’d had in the past. Of the two dumplings, I definitely preferred the pork on its own without the crab. To me, there is something pure (not in the Kosher way) and simple about about those pork soup dumplings that makes them great. Next, we had the Shanghai Rice Cake with shrimp. 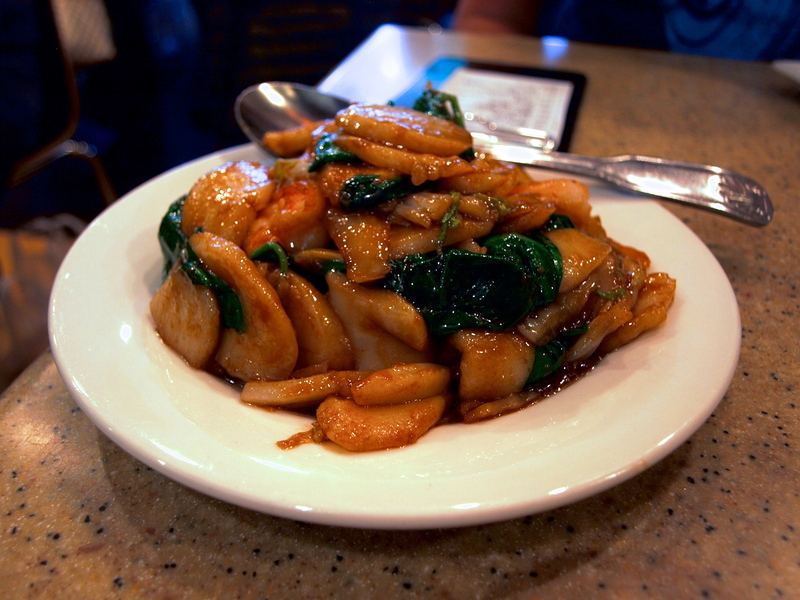 The dish consisted of little rice cakes stir fried in a delicious brown sauce, with shrimp and some sort of green leaf that was only there because I was sharing with my friend. The little rice cakes are kind of noodle-y and do a great job of absorbing flavor and adding a unique texture to the dish. They definitely made for a nice change from all the dumplings we were eating. And speaking of dumplings, we also had ourselves a batch of Shrimp and Pork Shao Mai. 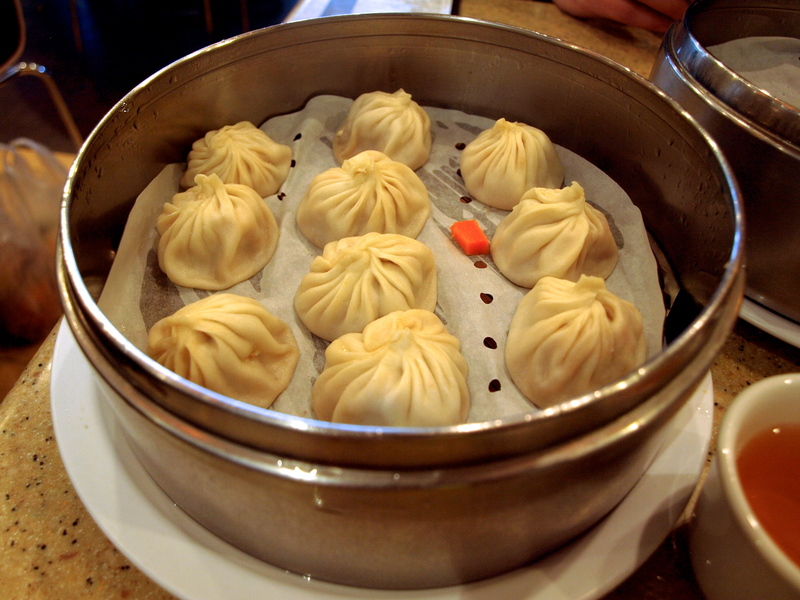 As opposed to the crab and pork Xiaolongbao, these kept the two animals separated and depending on the way they were eaten, it could be a mix of meats or not. While these dumplings weren’t bad by any means, I definitely didn’t feel that they were nearly as good as the Xiaolongbao. It’s like a dumpling on steroids. We finished off the main meal with some classic Pork Buns. These thick, bready buns were filled with an entirely different pork than any of the dumplings we had eaten. These were more on the sweet side and a tasty way to mix things up. 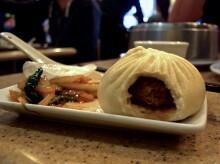 Yet, after destroying so many dumplings earlier in the meal, the pork bun was a bit hard to tackle because of its size. Pour less sugar on me. For the finale, we ordered Sweet Taro Dumplings. If you’ve been reading this blog for a while, then you know I have a special place in my heart and stomach for taro and the prospect of eating taro dumplings excited me. They came out looking like regular Xiaolongbao, but inside they were filled with the good old purple stuff. Well, kind of. They weren’t lying when they called them “Sweet Taro” because these sure were sweet. For someone who loves sweet red bean, the sweet taro would be perfect, but I am not one of those people. It was the first time I had been let down by taro and I will be sure to think twice before eating a sweetened version of that delicious tuber again. Din Tai Fung definitely delivered the goods on the dumplings. Although it has been a while since I’ve been in China, they definitely did justice to my memory of the motherland. Now, if only a branch of Yang’s Fried-Dumplings would open on this side of the ocean, we’d really be talking!